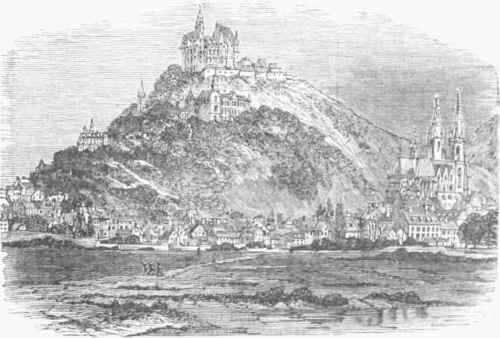 Marburg, a town of Prussia, in the province of Hesse-Nassau, on the river Lahn, 49 m. S. W. of Cassel; pop. in 1871, 9,065. The principal public buildings are the church of St. Elizabeth, a fine, perfectly preserved specimen of the pointed Gothic, built in the 13th century, and the ancient castle of the landgraves of Hesse on the Schlossberg (now used as a penitentiary), where the famous discussion on transubstantiation between Luther and Zwingli took place, Oct. 1-3, 1529. The university of Marburg was the first founded in Germany after the reformation, by the landgrave Philip the Magnanimous (May 30, 1527); it was richly endowed from the proceeds of the confiscated property of the clergy, and attracted students from all parts of Protestant Europe. Although a rival university was established in Giessen in 1607, it continued to flourish until the outbreak of the thirty years' war. From 1625 to 1650 the Giessen university was united with that of Marburg, but they have since been again separated, the former being now the national university of Hesse-Darmstadt. In the first part of the 18th century Marburg derived great celebrity from the philosopher Christian von Wolf, who was one of the professors. In the winter of 1873-'4 the university was attended by 433 students, mostly medical. It contains a library of about 130,000 volumes, an anatomical theatre, an observatory, an admirable chemical laboratory, a botanic garden, a lying-in asylum, a clinique, a school for veterinary surgeons, a zoological museum, a philological seminary, and one for political sciences. Marburg possesses also a gymnasium and other educational institutions, a society for natural history, and a Bible society. The chief manufacture is pottery. The town was several times besieged during the seven years' war. In 1806 and 1809 it was the scene of risings of the Hessian peasantry against the French, who destroyed in 1810 and 1811 the greatest part of the fortifications of the castle.